The Hubble space telescope has given us decades of incredible images, but it’s reaching the end of its service life and the question is, what will come after? One possibility is the Aragoscope from the University of Colorado Boulder, which uses a gigantic orbital disk instead of a mirror to produce images 1,000 times sharper than the Hubble’s best efforts. The Aragoscope is named after French scientist Francois Arago who first noticed how a disk diffracted light waves. The principle is based on using a large disk as a diffraction lens, which bends light from distant objects around the edge of the disk and focuses it like a conventional refraction lens. The phenomenon isn’t very pronounced on the small scale, but if the telescope is extremely large, it not only becomes practical, but also extremely powerful. When deployed the Aragoscope will consist of an opaque disk a half mile in diameter parked in geostationary orbit behind which is an orbiting telescope keeping station some tens to hundreds of miles behind that collects the light at the focal point and rectifies it into a high-resolution image. “The opaque disk of the Aragoscope works in a similar way to a basic lens,” says CU-Boulder doctoral student and team member Anthony Harness. “The light diffracted around the edge of the circular disk travels the same path length to the center and comes into focus as an image.” He added that, since image resolution increases with telescope diameter, being able to launch such a large, yet lightweight disk would allow astronomers to achieve higher-resolution images than with smaller, traditional space telescopes. 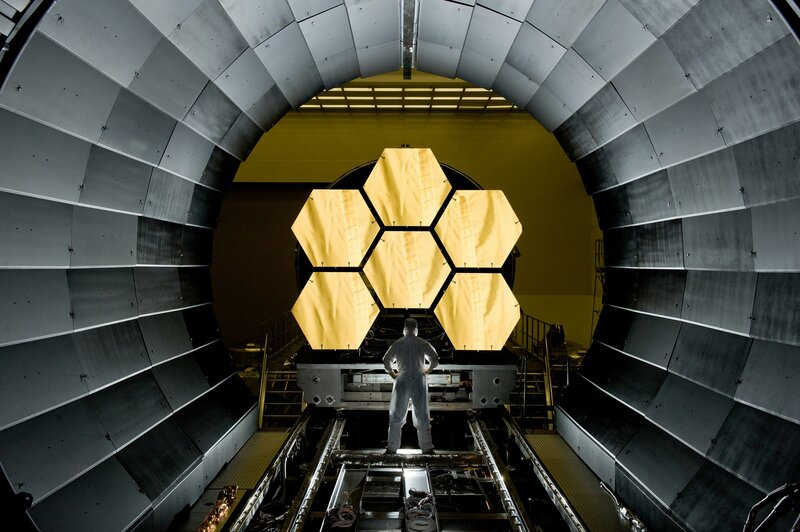 The Aragoscope is similar to the starshade being developed for NASA, which uses the same telescope and giant floating disk architecture. But where starshade uses the disk to create artificial stellar eclipses to aid planet hunting, the Aragoscope turns the disk into a gigantic diffraction lens. According to the team, the similarity is no coincidence, since starshade was developed by members of the Aragoscope team. The new orbital telescope was selected last June by NASA as one of 12 proposals for its NASA Innovative Advanced Concept (NIAC) program – each of which received US$100,000 to fund nine-months of research for projects ranging from capturing asteroids to sending submarines to the lakes of Titan. The Aragoscope is now up for being one of six projects that will receive an additional US$500,000 in April. The team sees the Aragoscope as a way to penetrate farther into the universe to observe phenomena like black hole event horizons, or turned on the Earth to pick out objects the size of a rabbit. The next phase of the project involves testing the concept. This will involve laboratory work using a one-meter disk set several meters from a telescope. If this is successful, a more dramatic demonstration will use a disk set on a mountain top while a telescope mounted on a helicopter tries to focus on the star Alpha Centauri.